A group of women sit on sacks of rice and maize in Wajir, Kenya. Weather-driven concerns about sugar and palm oil supplies have led to a price increase of major food commodities in October, said Food and Agriculture Organization (FAO) today. Weather-driven concerns about sugar and palm oil supplies have led to price increase of major food commodities in October, said Food and Agriculture Organization (FAO) today. The FAO Food Outlook released today said that its Food Price Index averaged nearly 162 points in October, up 3.9 per cent from September, while still down 16 per cent from a year earlier. The latest Cereal Supply and Demand Brief of the UN agency slightly reduced its forecast for global cereal production in October 2015 and now projects production at 2.53 billion tonnes, 1.1 per cent below last year’s record output. FAO said that the reduction reflects dimmer expectations about maize crops in India and Ukraine, mostly due to adverse weather. 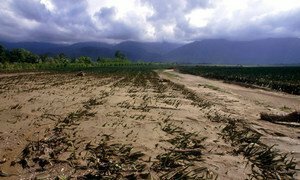 Additionally, the UN agency said that drought in Thailand prompted a plummeted projection of the seasonal rice harvest. FAO also said that the forecast for global wheat production has been raised, largely reflecting a bigger harvest in the European Union than earlier anticipated. The UN agency also expects would cereal stocks to remain at a good level as global wheat inventories are rising further, reaching their highest level in 15 years. The FAO’s Sugar Price Index led the overall rise, surging 17.2 per cent from September due to fears that excessive rains in Brazil would impact sugarcane harvests backed by reports of drought in India and Thailand adding that the sharp jump reversed the sub-index’s decline since February. The UN food agency also reported a 6.2 per cent increase in the FAO Vegetable Oil Price Index as concerns intensify over the impact of El Niño on next year’s palm oil supply in Indonesia, couples with coupled with slow progress in soybean plantings in Brazil, due also to unfavourable weather. Further, FAO reported that the Dairy Price Index rose 9.4 per cent from September on concerns that milk output in New Zealand would decline but added that the Meat Price Index remained stable. Additionally, the report also found that the Cereal Price Index also surged by a modest 1.7 per cent, mainly due to growing concerns over dry weather conditions affecting wheat crops in Ukraine and southern parts of the Russian Federation.